What a Way to Spend Christmas Eve – Malarky! Christmas Eve at Changi Village was not as chilly as I initially expected. Cars Cars Cars! Darn! The carpark was full! Argh! Couldn’t even find a decent lot. So Ah Long decided to park the car illegally along the double-yellow lines and guess what! He actually bothered to peel a parking coupon and display it at the dashboard! DUH! I mean, if I were the carpark attendant, I would have given him a ticket for parking illegally, with or without carpark coupon! His theory was – he could give the excuse that there wasn’t any lots available so the fault didn’t lie with us?! Never could understand the Geminis! Dinner was great, value for money, with fun company. But it wasn’t spectacular enough to warrant more than 3 lines in blog. Hah! Now for the more interesting part. 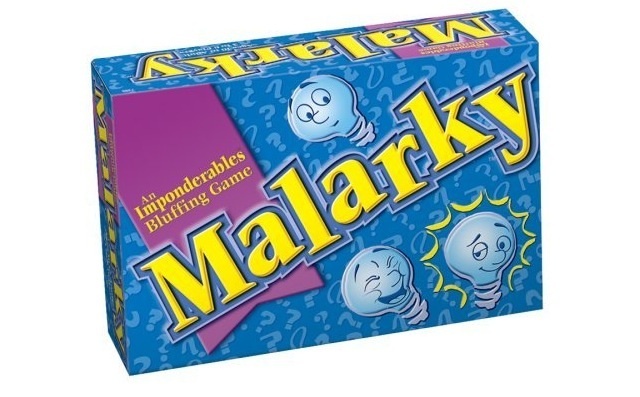 We adjourned to Vic’s house for a game of Malarky. We ended up watching bits and pieces of “Band of Brothers”. We wanted to begin the game at Christmas sharp. Nah! We were just intrigued by the gory scenes. Shrug. Probably would borrow the dvds from him to finish the whole mini series. Basically, it’s a game in which great storytellers would thrive in (have no doubt, this is one of my favourite games!). It’s something like trivia pursuit, yet instead of asking the others to guess the answer, you give them the answer and let them guess if it’s true of false. Therefore, you need to possess a certain level of imagination (Me me!) and a straight face. To earn points, you need to either weave believable tales, or tell the truth with a shifty look. Not only that, you need to have a hound’s nose to sniff out a lie. Hey! You are talking to a master over here! 30 points ahead of no.2, with the rest differing from one another by few mere points. What’s the difference between skimmed and non fat milk? My totally logical answer told with a straight face : Well, the difference is, for skimmed milk, the fat is removed by scrapping away the milk curds at the top, while, for non fat milk, the fat has been clinically removed from the beginning. Anyway, the real answer is – No difference. Haha! Fooled you! Didn’t I? *Orchard Road – Being a miniscular country, people tend to flock to Orchard Road, our main shopping strip, when they can’t think of anywhere better to go. Nick here..I wanna play too…keke..
Too bad, it belongs to Victor! Erm, I mean, storyteller. hehe.